BERLIN (Reuters) - The founder of the Eurosceptic Alternative for Germany (AfD) has dismissed reports that an identity struggle between economic liberals and right-wingers is tearing the party apart. In recent weeks, German media have been full of stories about infighting in the AfD, which was set up in 2013 to oppose euro zone bailouts and has since stolen votes from Chancellor Angela Merkel's conservatives. But Bernd Lucke, an economics professor who once belonged to Merkel's Christian Democrats (CDU), said the AfD - which Merkel and other senior conservatives have ignored in the hope that it will implode like other protest movements - denied a split was imminent. "This impression is completely wrong, but the newspapers always like to report on things they consider to be somehow detrimental to the AfD," the 52-year-old, one of three party co-leaders, told Reuters in an interview on Friday. He acknowledged the AfD was in "very lively" discussions about its first party program, which is due to be adopted at a congress in November. The party also plans to scrap two of the three co-leader positions this year and Lucke hopes to take sole control. "There are fierce debates, and perhaps some parts of the party are more sensitive to the tensions," said Lucke, a member of the European Parliament. "But there's a very strong and broad-based will to make the party a success, and it certainly won't be if we split." Recent polls show the AfD hovering on or just above the 5 percent threshold needed to enter the national parliament, having already won seats in four state elections. But with an election looming in May in the city-state of Bremen, voters appear unsure what the AfD stands for as economic liberals, including Lucke, are challenged by a faction that wants to push the AfD to the far right. 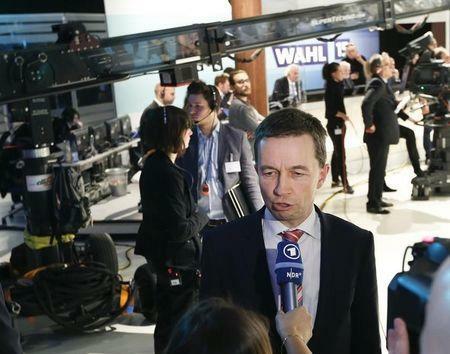 Last week, Lucke wrote to the party's more than 20,000 members to call on them to use a vote for the party's leaders in June to choose the AfD's future direction. He criticized the right-wingers for focusing on populist issues such as immigration. In a recent manifesto, right-wingers accused the AfD of hastily distancing itself from "civil protest movements", alluding to controversial anti-Islam protests, and of "cowardice and betraying our country's interests" instead of protesting against the "erosion of Germany's sovereignty and identity". The liberals have, in turn, accused the right-wingers of seeking to make the AfD a pure protest party bent on provocation. "Of course the AfD's task to become a successful, modern people's party isn't over yet," Lucke said, "but we've made very good progress in the last two years."